If you can’t beat them, join them. Rather than fight tooth and nail or admit defeat, Adobe is making the right move by developing products specifically for HTML5. The new products will take some of the lessons learned from Flash in order to create similar platforms, only these new platforms will be based on HTML5. This is good news for web developers who want to provide users with an animated, interactive experience. The one advantage that Flash had was the ability to generate not just videos, but interfaces. It will be interesting to see what products they have to offer. Thankfully, the fact that the end product will be designed for HTML5 means that these new interfaces and videos will be viewable on virtually all devices and browsers, and the content will be more easily crawled by the search engines. While Google made some changes in recent years in order to extract some of the information from Flash files, the result was still a mess for anybody concerned about SEO (Search Engine Optimization). Sites consisting entirely of Flash don’t separate the content into different pages, so all of the content gets mashed into one big mess. HTML tags are absent. Flash almost always takes too long to load, and many browsers don’t even have Flash installed. Microsoft’s #silverlight platform, a competitor to Flash, is completely dead in the water. Even before Adobe’s announcement, it wasn’t even clear whether Microsoft was going to release another version of the platform. It suffered from many of the same problems Flash did, most notably the incompatibility with various browsers, especially mobile devices. While HTML5 is an improvement over Flash in many ways, it’s not gong to solve all of your problems. While the various tags and attributes available through HTML5 will allow you to offer more information to Google than ever before, the search engine still can’t crawl the actual content of a video. It is still best practice to avoid making sites or pages based entirely on video. It is a far better option to include a full transcript of the video, either on the page itself or within the HTML attributes as the fallback content. Generally speaking, a video should be treated as a benefit for readers, but it should be included on a page that follows all the same criteria of a traditional site page. By the same token, avoid creating videos that play automatically. The user should always feel like they are in control of their own experience. Video introductions annoy most users and are likely to send them screaming for the back button. In many cases they will also slow down the user experience and lead to frustration. Multimedia can do a lot to enhance your site, but incorporate it in a way that is friendly to your users and to the search engines. 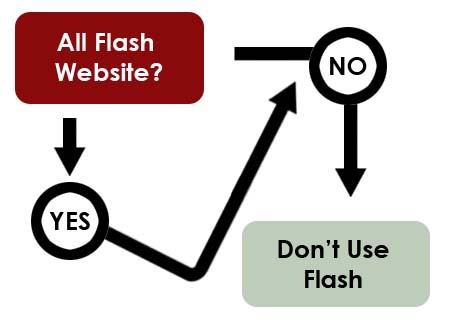 By necessity, that means staying away from Flash.